Paying a dividend is the most common way for companies to share profits with stock-owners directly. The first record of a company paying a regular dividend belongs to the Dutch East India Company (VOC). The VOC paid annual dividends both in cash and in spices worth about 18% of the value of its shares for almost 200 years of the company's existence (1602–1800). 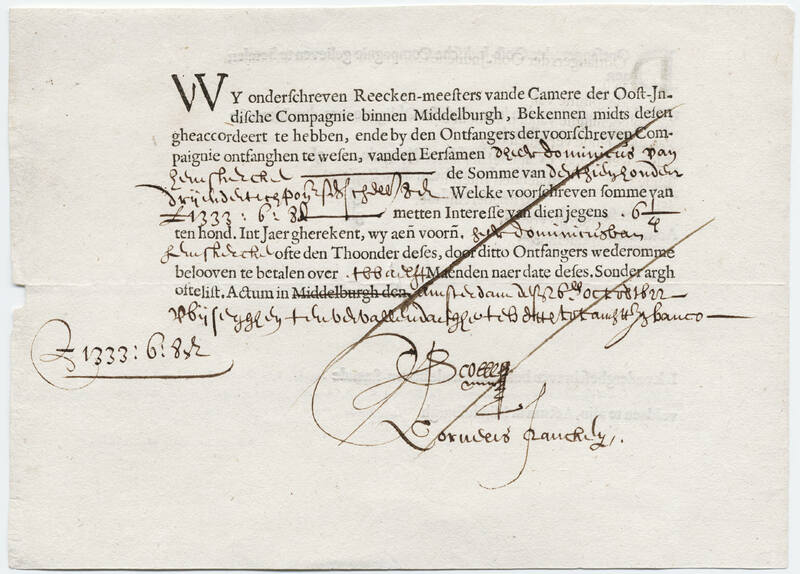 Dutch East India Company bond, printed 1622–1623. Of course, modern dividends are mainly paid out in cash, usually through an electronic transfer or, less often today, a paper check. Approaches to dividend investing in the 20th century were, and still continue to be, influenced by the works of Benjamin Graham and David Dodd. Graham and Dodd, the fathers of value investing, argued that the intrinsic value of a stock could be measured and compared to its market value based on factors such as assets, earnings, and dividend payouts. Seems like a pretty basic idea today. But 100 years ago, this was cutting-edge stuff. For more information on value investing, I urge you to read Graham's landmark title, The Intelligent Investor: The Definitive Book on Value Investing. Warren Buffett calls it "by far the best book on investing ever written." Of course, the value-investing paradigm wasn't without critics. It still isn't. The argument of value versus growth stocks is among the most debated topics on Wall Street. Value investors continue to promote the magic of compounding dividend returns. And their rivals continue to point to low returns and inherent problems with dividend-yielding equities. Some investors will still choose to invest only in dividend-producing stocks. Others will completely ignore any dividend that an equity might provide. But we'd like to offer you a different approach to dividend investing today. It's neither all in nor all out. Instead, it's a middle-ground approach of sorts. And it's among the best ways for most retail investors to take advantage of long-term dividend yields. It's not a large hole. But it's big enough that if you don't plug it up somehow, you'll sink. And the boat is your wealth. The purchasing power of your money is slowly being eroded by inflation, which is the creation of new money and its introduction into the market. And unless you're making more money to keep up with the rate of inflation, you're growing poorer by the day — even without spending a dime. Earn enough money through stock dividends to cover losses from inflation. This is easier than it sounds. The thing about inflation is that it's fairly predictable. In 2018, the annual inflation rate is expected to average about 2.5%. Over the next five years, analysts expect inflation to lower to around 2%. This means that to beat inflation, you'd only need to make 3% or 4% (taxes considering) in dividends. That's also a pretty easy task. Although it's hovering under 2% right now, the historical average dividend yield from stocks on the S&P 500 is about 4.4%. Average dividend yields vary by sector. But it isn't difficult to beat inflation with dividend payments alone. Our analysts have successfully used this simple method and have applied it to their own expertise. Cannabis-investing expert Jeff Siegel has implemented it into his marijuana portfolio with a cannabis real estate investment trust (REIT). And oil guru Keith Kohl has included many dividend-paying stocks in his energy portfolios to hedge inflation specifically. Meanwhile, Bull and Bust Report Director Chris DeHaemer recently added high dividend-paying coal companies to his portfolio. Dividend returns are unlikely to make you rich, even if you invest a significant amount of money into them. With a 4% annual dividend, you'd need a million-dollar investment just to make $40,000 a year. But this little bit of money can plug that hole in your boat. Of course, there are a few factors that you'll need to consider before setting up your portfolio for this approach, including tax, trading fees, etc. But even if you manage to cover half of your losses from inflation through dividends, you'd be doing better than most people.